Nestled in the gently rolling hills of the South Downs in West Sussex, the town of Arundel is steeped in ancient history. The town’s landscape is dominated by the formidable Norman castle. Within the town itself you will find a range of accommodation choices, with some cheap Arundel hotels and b&b rooms available. However, because of its rural location, you can also find accommodation ranging from a fisherman’s cottage to farmhouse bed and breakfast if you look further afield to the villages and farms surrounding the town. Several properties provide a swimming pool. Why Visit South Downs NP? 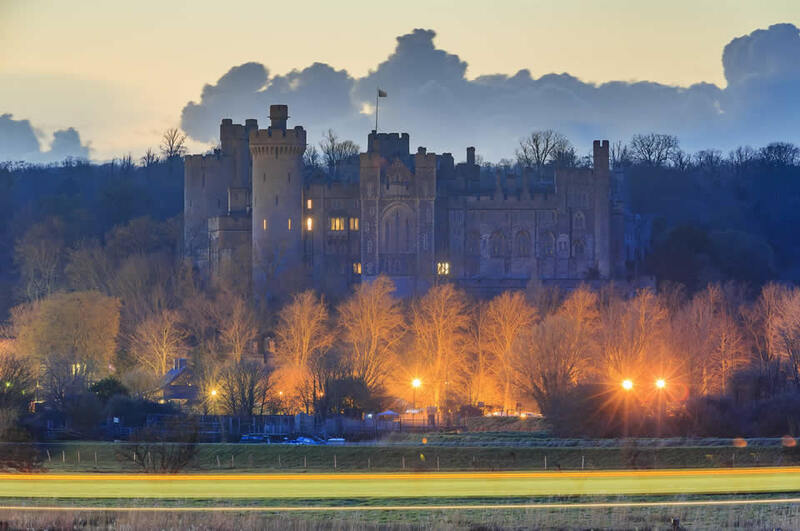 Arundel became the ancestral home of the Dukes of Norfolk, which it remains to this day. The town is also home to a splendid Catholic cathedral built in the French Gothic style. Guided tours are available and organ recitals are also a regular feature. Winding its way towards the sea at Littlehampton, the River Arun runs through the centre of the town, spanned by an elegant arched road bridge. With plenty to explore in and around, you can be sure of a peaceful and refreshing break. Arundel lies in the south of England UK in West Sussex, located southwest of London, west of the seaside resort of Brighton. The town centre has long been popular with antique hunters. With antiques centres, a market and plenty of individual antique traders, you can find treasures ranging from high end antique furniture to decorative collectibles. With art galleries, live music and theatre on offer, Arundel is a cultural delight. And when you need a break from exploring the scenic streets, enjoy a meal or afternoon tea next to the river as you watch the river boats glide through the water. Boats are available for private hire, or you can opt to experience a river cruise, just sitting back and enjoying the picturesque scenery. Any visit to Arundel has to include a tour of the towering medieval castle, with time to relax in the spacious gardens. If you are fortunate enough to be in the town centre with children during August weekends, look out for a range of street entertainment, from tradition Punch and Judy to magic shows. It all culminates in the spectacular Arundel Festival during the final weekend in August. If you want to tour further afield, there are sandy beaches and clear, clean sea water to enjoy at the nearby resorts of Littlehampton, Bognor Regis and Worthing. The ancient town of Chichester, with a wide range of high street and niche shops to explore, is within easy reach, or you could try your luck at the races with a visit to Fontwell Park. Amberley Museum is a treat for the whole family, where you can spend a day exploring the industrial heritage of the south east. Watch wheelwrights and traditional cobblers at work, then enjoy a ride on an early bus or the narrow gauge railway. If open country is your preference, the wide green spaces that spread for miles around the town offer plenty of walking, cycling and horse riding trails. Choose accommodation to suit your taste, from a town centre hotel room with swimming pool, to a peaceful riverside b&b or guest house to the rural charm of a barn conversion. Whatever your choice, you can be sure of cheap accommodation to match your budget. Main town train station located within walking distance of the town centre. Trains are operated by Southern rail company and run to London Victoria railway station and Bognor Regis rail hub. 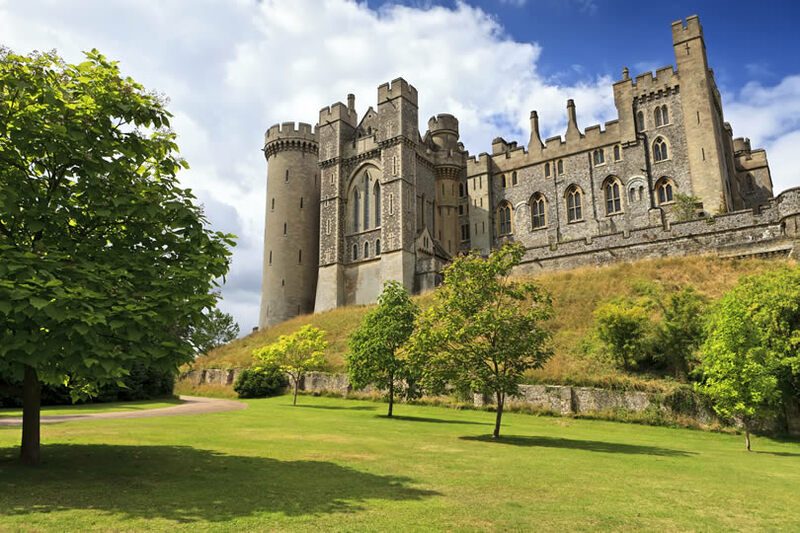 Arundel Castle was founded by Roger de Montgomery on Christmas Day 1067. It’s a restored medieval castle and is still the principal seat of the Norfolk family. Find the perfect stay in central Arundel United Kingdom. Stay nearby the cathedral, cricket club, in town center, not far from the museum, and South Marsh Mill, and just off the A27 (Chichester Road) and A284. Places to stay in the center are an excellent base for visiting the spectacular Castle grounds or exploring the delights of West Sussex, Chichester, Bognor Regis, Fontwell and Goodwood. Location : town is located in the southern part of England. The capital city of London is less than 50 miles away. Brighton & Hove is about 20 miles to the east (look for seafront bed and breakfasts) and Chichester is 10 miles to the west of town. Spectacular medieval castle and amazing gardens. Beautiful area with varied wild life in abundance. There is plenty to do and see, lovely boat trips and many activities for the kids. Very interesting museum in nearby Amberley, set in an old Chalk Pit. A train runs on the old quarry track and an antique bus travels around the huge site. Cathedral Church of Our Lady and St Philip Howard. Impressive Cathedral with much historical information. 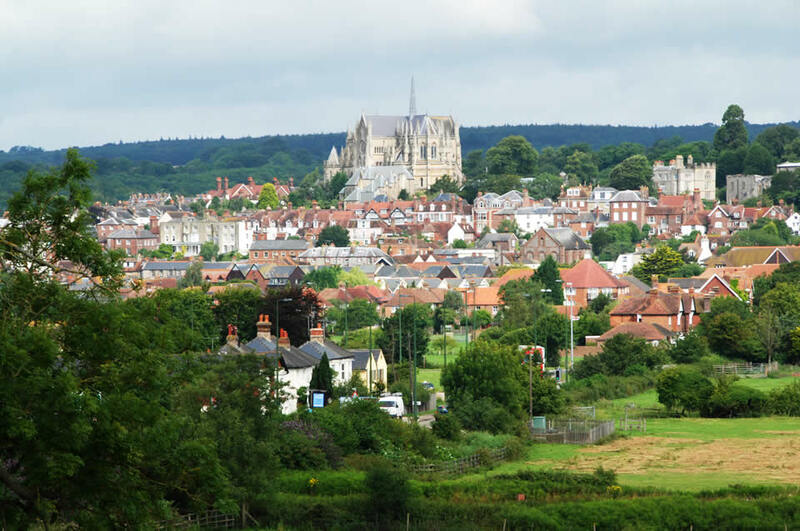 The town is surrounded by the beautiful countryside of West Sussex. Lively Bognor Regis is a 20-minute drive away. Within easy reach is Brighton’s seafront.